Hazan Haim Mizrahi was born in Turkey and lived in Israel before coming to the United States more than 30 years ago. Haim Mizrahi was the Hazan in the world famous historical synagogue Neve Shalom in Istanbul. Eventually, he and his wife with their two children felt the desire to make an aliyah to Israel and lived there for 10 years when the Sephardic Community in San Diego discovered him and convinced him to come and become Hazan for the Sephardic Community there. As luck would have it, some leaders from Sephardic Temple heard about this amazing Hazan in San Diego and asked him to join our community. 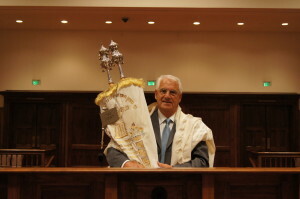 Hazan Haim Mizrahi has been the Hazan at STTI since 1990. His sweet and strong melodies along with his magical voice are not also inspiring but also admired by many. Our children of our Talmud Torah feel a special connection to Hazan Mizrahi because of his nurturing, patient and loving ways as he prepares them for their B’nai Mitzvahs. He is often pursued by many in the community to perform the very important and complex procedure of the Brit Milah. Hazan Haim Mizrahi’s enthusiasm for Jewish music has created an energetic, contagious, and often inspiring environment for the congregants of all ages. As a deeply spiritual man, he spends his time teaching our children, visiting the sick and elderly and working on behalf of those less fortunate.